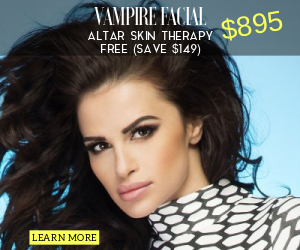 In the first part of the Vampire FaceLift® procedure, the physician uses a Hyaluronic Acid (HA) filler (like Restylane or Juvederm) in a very specific way to sculpt a younger appearing face–while still keeping the shape natural. Providers of the Vampire Facelift (R) procedure take into account the mathematics of beauty as defined by much research (starting with the notebooks of Leonardo da Vinci) to avoid at all costs creating an unnatural shape. These ideas about the HA fillers are not commonly known even among the best of cosmetic surgeons and constitute part of the intellectual property protected by the trademarked name (Vampire Facelift®).